The boyfriend is back. And he’s coming for you… That’s the chilling blurb on the back of Amanda Brooke’s gripping new novel, Don’t Turn Around. 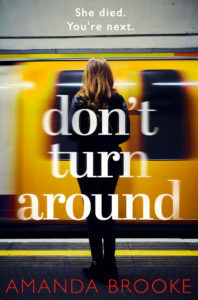 This was the first of Brooke’s nine novels that I’ve read and while the subject matter of Don’t Turn Around is distressing the writing is so pacey that I read it in one sitting. It’s ten years since Jen’s bewitching teenage cousin Meg killed herself after failing to escape an abusive relationship. Now, much to the horror of Jen and Meg’s mother Ruth, Meg’s ex-boyfriend is back in their home city of Liverpool. The domestic abuse helpline launched by Ruth and Jen in the wake of Meg’s death has started receiving terrifying calls from a girl who knows secrets about Meg that only the man who hurt her could know. The story is told from the viewpoints of Jen and Ruth in turn, a device that adds depth and nuance to this well-plotted drama. It makes for a compelling read although I questioned the apparent ease with which Ruth and Jen set up their helpline. The two women are in the depths of grief a decade after losing Meg so are they really equipped to help the victims of domestic abuse who call into the Lean On Me helpline? While Brooke handles the complex relationships in Meg’s life brilliantly, switching back and forth in time, it wasn’t hard to guess the denouement of the drama. Even so, there was no way in hell I wasn’t going to finish this book. I suspected from about halfway through the book what must have happened to Meg but I was desperate to keep reading – and I’m definitely going to read more of Brooke’s novels.